The Greater Swiss Mountain Dog is an enormous dog which is surprisingly gentle. 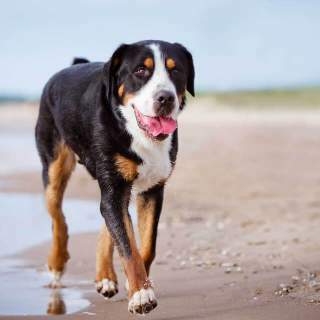 Although the breed has basically been revived after being mistaken as short-haired Bernese Mountain Dogs, they have apparently been around for some time in the northern regions of Europe. It's not difficult to distinguish these dogs from Berners, however, as they are much larger. A long time ago, the Greater Swiss Mountain Dog was primarily used to pull carts of all kinds: wood, dirt, rocks, food, and a multitude of items for sale in the streets of towns and cities throughout Europe. They were also used for herding, protection and companionship. These days, they are used for a fair bit for work but primarily are pets for people. They are easy-going dogs that mature slowly. First-time dog owners who have patience and space for the Swissys should be fine. There is plenty of information about these dogs despite the breed being only a century or so old. It must be said that, when looking into Greater Swiss Mountain Dog 101, you'll find that these dogs are of average intelligence. They work hard and appear very happy to do so, and they will often want to please you. Pulling carts is perhaps their best-known task, and yet dog carts are long gone. They can herd and do other tasks too, however. They are a bit overly aware of their strength but not so much how to restrain themselves, and you will need patience to train them during their slow march to maturity. These dogs tend to be more bark than bite, literally. They will put up a show to dissuade a predator, and due to the breed's size, this is often successful. They are gentle but the can be clumsy in their later adolescent stages when they are adult-sized but not of adult mind. The best information you can know about Swissys is that a calm method of training will work much better than harsh means. They doesn't need a lot of exercise, but they do need occasional spurts of strenuous activity. How long should such spurts be? When your Swissy wants to take a nap, they've had enough for he time being. There is a good bit of breed information available on these dogs to learn why they are given to their type of activity. The Swissy is said to have only one color even though that color is itself comprised of three colors. Labeled a tri-color dog, the colors are black, red, and white. It should be noted that the American Kennel Club informally recognizes two other colors not discussed below: blue, white and tan, and then red and white. There is the rare instance of the red Greater Swiss Mountain Dog and the even more rare blue Greater Swiss Mountain Dog. These two dogs' rarity makes them a commodity for some people for no other reason than they are rare. Reputable breeders, however, prefer to not have these dogs owing to the genetic complications that include undesirable traits, physiological malfunctions and other problems. When red and blue do occur, it is due to recessive genes dictating a particular dog's color. When considering Greater Swiss Mountain Dog size, it's best to understand that these are one of the heaviest dog breeds around. The typical weight and height is dependent on whether the dog is female or male, and there is a significant difference. Mature males weigh 105 to 140 pounds. Fully grown females weigh 85 to 110 pounds. Height is much the same even though males are only slightly taller than females. Males stand 26 to 29 inches, and females are 24 to 27 inches tall. There are no varieties or types when it comes to the Greater Swiss Mountain Dog. There is a good bit of confusion, however. At one time, the Swissy was believed to be a short-haired Bernese Mountain Dog. That was until 1908, and in short order — no pun intended — the Greater Swiss Mountain Dog breed was essentially revived. These days, it is not unusual for people to mistake a Bernese for a long haired Greater Swiss Mountain Dog, or a Swissy for a short-haired Berner. On the other hand, there are people who are falsely led to believe that they can adopt a miniature Greater Swiss Mountain Dog. If such a dog also appears to be a short haired Greater Swiss Mountain Dog, then that is almost certainly a hybrid or merely a puppy that has yet to grow to full size. If such a dog has long hair, then it is most likely a Berner and not a Swissy. Not all large Swiss mountain dog breeds look alike, but these two share a lot of similarities. Be sure to be able to identify what or which breeds you are looking at. The Greater Swiss Mountain Dog temperament is an appreciable one. These dogs are willing to work, ready to defend and yet eager to make new friends so long as they don't detect a threat. They are large, strong and a bit stubborn, and they know it. On the other hand, they are gentle with children and highly tolerant of their noise, exploration, and general rambunctiousness. They love to be around their family and will basically follow along in whatever activity or rest they do. They are naturally playful and can be a handful at an early stage. You don't want them to grow bored or they may become uncontrollable. Another of the Greater Swiss Mountain Dog characteristics is to be a bit bossy toward people and other dogs perceived as being lower on the totem, but they don't have a tendency to be aggressive. They are not given to chasing small animals much. The Greater Swiss Mountain Dog has a lot of the typical dog issues: they bark a lot, they easily acquire separation anxiety, and they can appear unfriendly if something upsets them. You can train them to bark less but not by much; they are very sociable dogs who will miss you sorely; and they tend to only make a show of possible aggression. These are outdoor dogs that nonetheless will be happy to stay inside so long as they are near their master, family, and friends. They get bored easily, however, so be prepared for daily bouts of high-octane play to help prevent this. They don't tend to chase cats or get aggressive with other dogs, but they will run off to explore if allowed. Is the Greater Swiss Mountain Dog hypoallergenic? No. Do these dogs shed a lot? Fairly so. They also have a bit of a coat blowout in the spring and fall. The Greater Swiss Mountain Dog is a giant breed that, sadly, has a lot of the typical problems that affect giant breeds. Because of the severe inbreeding during the last century, which was done to keep the breed pure, these dogs have acquired lots of genetic issues. Some breeders have been protesting this practice, and some are even calling for a reduction in the levels of inbreeding. There also appears to be an emergent problem that is a concern: uncontrollable bleeding during surgery. While there is less than 1% of reported cases regarding the overall number of registered Swissys, it is believed that the condition occurs due to the perfect storm caused by a number of health concerns that a single dog may develop. The average lifespan for the Greater Swiss Mountain Dog is 10 to 11 years, a span that is typical for giant dogs.